Cubs players and legends will be honored before the ceremonial first pitch, including Ernie Banks, Glenn Beckert, Andre Dawson and others. In the fifth inning, Wrigley Field organist will lead Cubs faithful in singing "Happy Birthday." Then Dutchie Caray will lead the celebration during the seventh-inning stretch. The Cubs will be wearing throwback Chicago Federals jerseys, and ballpark staff will wear era-accurate Weeghman Park jackets and costumes. Although the Wildcat Band had just been founded a mere three years before old Weeghman Park opened, the band will wear their contemporary uniforms. This is not the band's first appearance at the friendly confines. 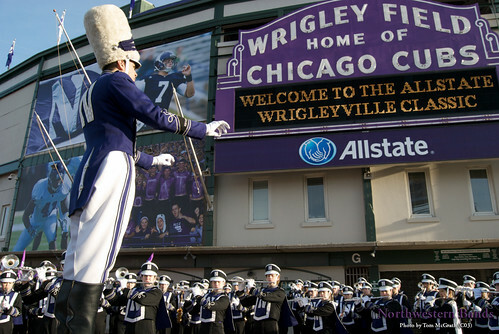 They appeared on ESPN's College GameDay in front of Wrigley's iconic sign (painted purple) and marched during the Northwestern vs. Illinois game hosted at the park in November 2010 in the first football match there since 1970. 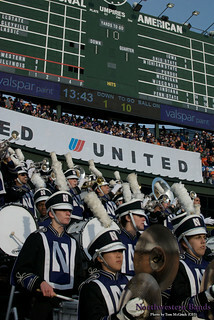 Of that performance, Cubs chairman Tom Ricketts told the Chicago Tribune, "When I saw the Northwestern band on the field at halftime, I almost cried." "We are thrilled to partner with a professional sports franchise as iconic as the Chicago Cubs," says Northwestern athletic director Jim Phillips. Looking forward to Wednesday, Farris says, "This is very exciting and a great opportunity." Fans are encouraged to arrive early to enjoy the festivities. Additional details are available on the Cubs website. Photos from 2010 Wrigleyville Classic by Tom McGrath (C03).